My mama always says that hand sewing is a very meditative practice for her. If it weren't for tonight's tangled threads, I would have to agree. I remember many afternoons spent sewing doll clothes with her fabric remnants while she worked at her machine or did embroidery and hand stitching. She would tell me stories about my grandma and her childhood adventures. It was our time alone. This craft brings back such good memories. 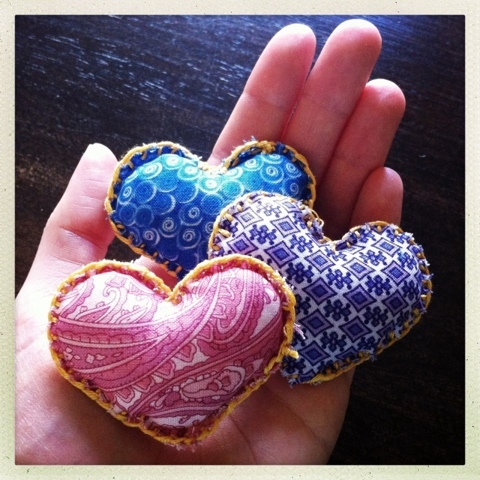 These sweet little hearts are going to be part of a project for a friend who is much more talented with needle and thread than I am. I hope she doesn't mind the uneven stitches and frayed edges. I like to think it adds to the charm. I wouldn't say hand sewing is my first creative passion, but it's definitely something I come back to when I feel like being quiet, and when I need a reminder of the importance of patience on the creative journey. One stitch at a time gets me there. Each stitch is an important part of the process. Tangled threads are part of it too. The creative process of sewing is such a lovely metaphor for life.